West Virginia teachers demonstrate for a pay increase. 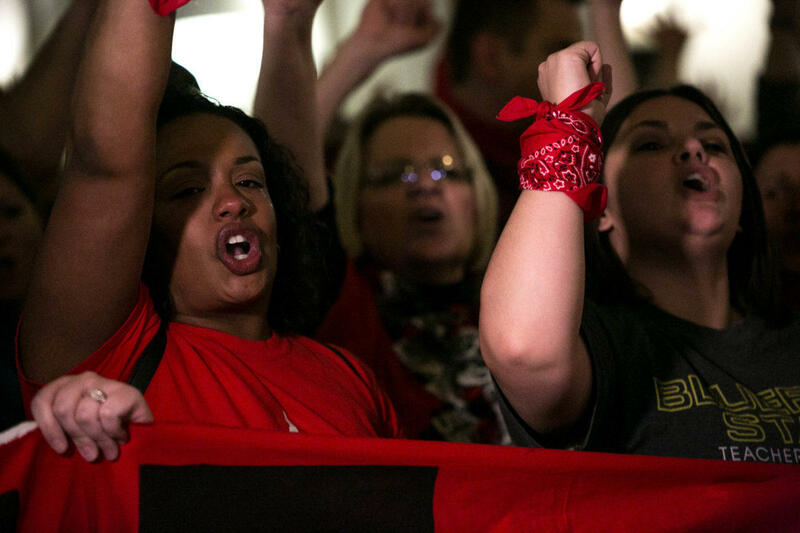 When Oklahoma teacher Sally Salmons saw momentum building toward teacher protests in her state, she immediately reached out to family ties and educators in West Virginia. She said teacher walkouts in the Mountain State provided her and colleagues across the state with the courage they needed to take a stand. “We looked at West Virginia and said, ‘Now’s the time to get on it.’ I think it gave us confidence to really, finally cross that line,” she said. 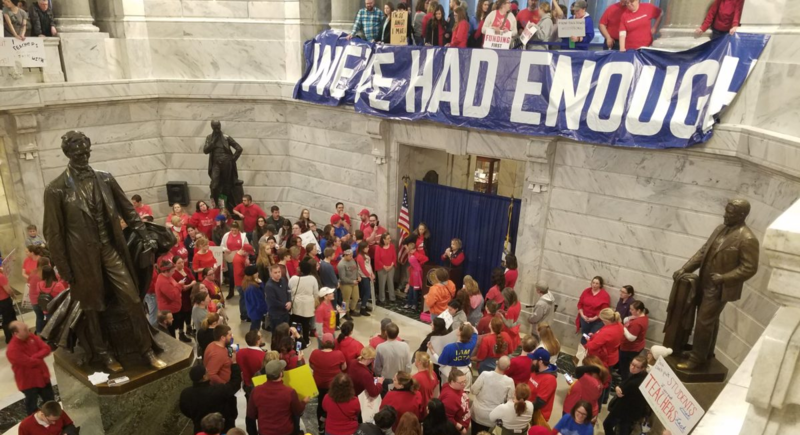 Kentucky teachers fill the capitol for a rally. Salmons has been teaching first graders in Norman, Oklahoma, for the last 15 years and she said in that time, school buildings and students have been neglected by lawmakers who control state purse strings. “This [protest] is to provide essential materials that we need to teach children; to get class sizes down, to get them the materials they need, to have them in safe buildings that have chairs and desks for all of them. That’s why we’re here. That’s it,” she said from Oklahoma’s state capitol, surrounded by thousands of teachers. 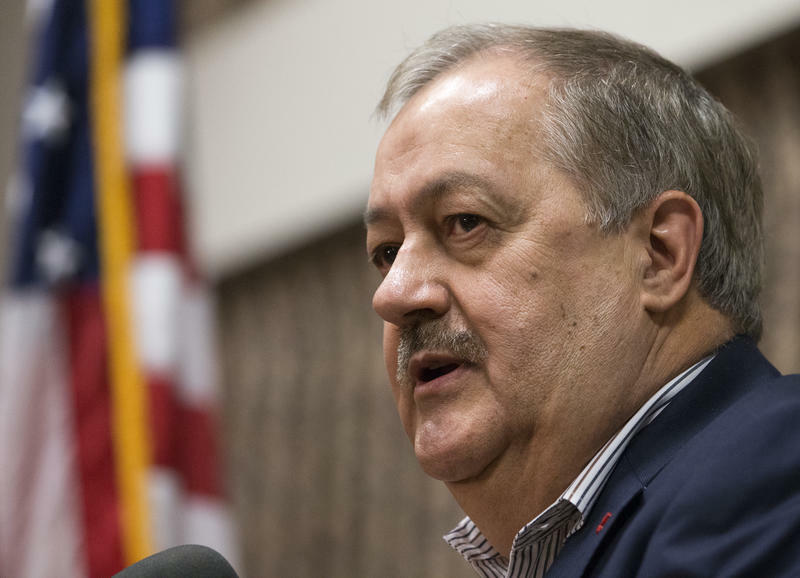 What started with grassroots activism in some rural West Virginia counties has now helped spark protests in four states and could end up having effects far beyond the classroom. The teachers are injecting energy into a moribund labor movement and are organizing to influence midterm elections in some of the country’s most conservative states. In Kentucky first grade teacher Rachel Keown was also inspired by West Virginia’s nine-day strike. “You look how communities in West Virginia rallies around their teachers and the support they got, and it gives me so much hope,” she said. Kentucky teacher Rachel Keown also taught in Oklahoma and West Virginia. Keown has a unique perspective. She got her teaching degree in West Virginia, then worked in Oklahoma schools before moving to Kentucky. She said working in crumbling, poorly funded Oklahoma schools was an eye-opener. In these deeply red states where organized labor has been in decline, teachers seem pretty fed up with underfunded schools, low pay, and changes to public pension programs. Educators in Oklahoma want funding for their schools. Arizona teachers want a raise. Kentucky educators like Keown are rallying for classroom and pension funds. Arizona, West Virginia and Oklahoma all ranked near the bottom when it comes to teacher pay. Kentucky teachers are better compensated, but have seen class funding decrease. The grassroots action spreading among teachers also raises questions about what’s down the road for organized labor. 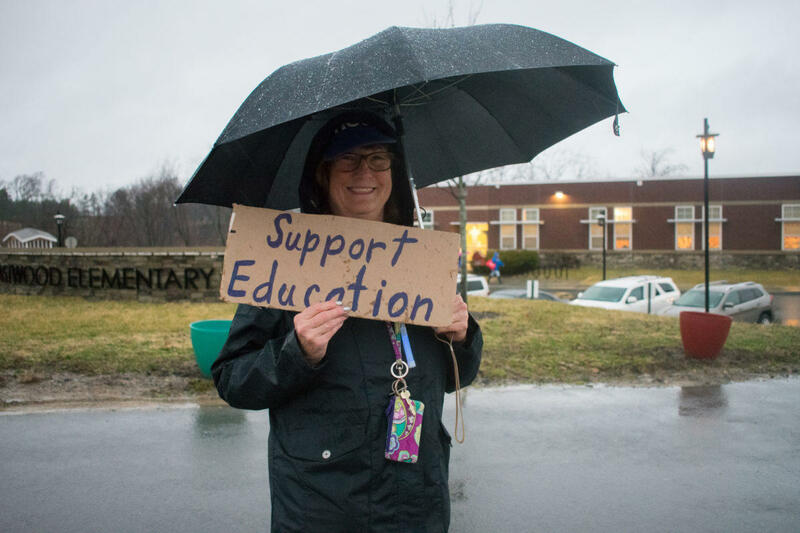 Wheeling, West Virginia labor lawyer Pat Cassidy sees the teacher protests as part of a broader groundswell of desire for systemic change. Cassidy said unions are at a low point of power and influence. West Virginia University History Professor Hal Gorby agreed and said that weakened unions can lead to unpredictability and disruption. For example, Gorby said, in West Virginia union leaders announced a deal had been struck a few days into the strike and encouraged teachers and personnel to return to the classroom. But that didn’t happen. Schools remained closed for another week until legislation was signed. Gorby said stronger union leadership and negotiating authority could have made things different. Conservative analysts offer a different perspective. Jessi Troyan, development director at the right-leaning Cardinal Institute for West Virginia Policy, said teachers are reacting to larger shifts in education. Teachers are also seeking change come Election Day, registering voters and recruiting candidates who will work for their cause. In West Virginia, union leaders like Dale Lee from the West Virginia Education Association are out canvassing the state, endorsing pro-education candidates. Lee said members are still energized and looking forward to elections. Mostly, unions are supporting Democratic candidates, but union leaders are also targeting incumbents on both sides of the aisle who didn’t support teachers during the legislative session. In Kentucky the Associated Press reported that at least 28 former or current educators, mostly Democrats, are running for office this election cycle in Kentucky, and that list is growing. Only five of 138 state legislators in Kentucky are teachers. During a recent swing through Kentucky, Democratic National Committee Chair Tom Perez said teachers are responding as red state lawmakers push policies too far to the right. “In states where you have Republican control of governorships and state legislatures, you see massive overreach,” Perez said. “And what you see as a result is Democrats are winning special elections up and down the ballot.” Perez pointed to recent special elections in Kentucky, Wisconsin, and Pennsylvania where Democrats won in districts that voted overwhelmingly for Trump. 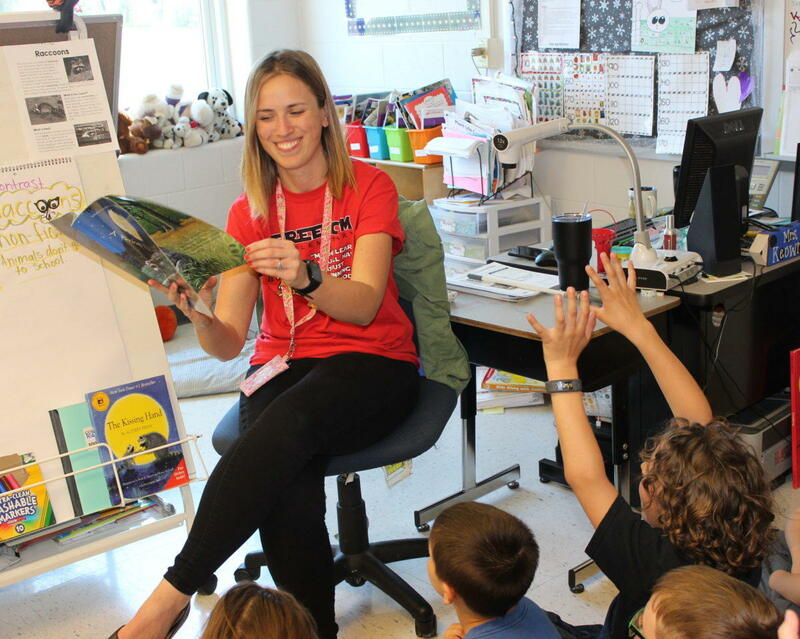 Kentucky teacher Rachel Keown said she and her colleagues are now more engaged in both union and government processes and expect to remain so. “Going forward, we have that momentum to make sure that we are electing and supporting pro-education government officials,” Keown said. But her main focus remains the children in her classes — her “babies,” she calls them. The following reporters contributed to this report: Ryland Barton, Jessica Lilly, Liz McCormick, Dave Mistich, Ardath Osborne, and Becca Schimmel. 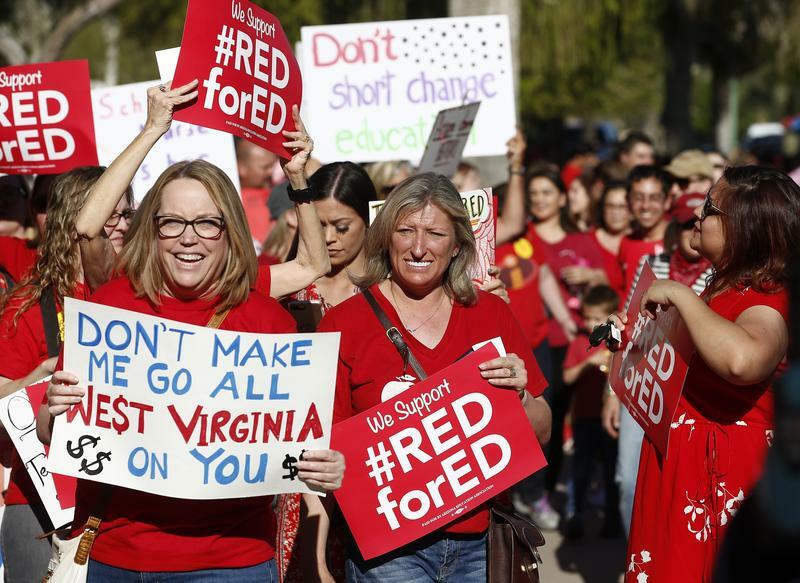 A teacher rebellion that started in the hills of West Virginia spread like a prairie fire to Oklahoma this week and now threatens to reach the desert in Arizona. 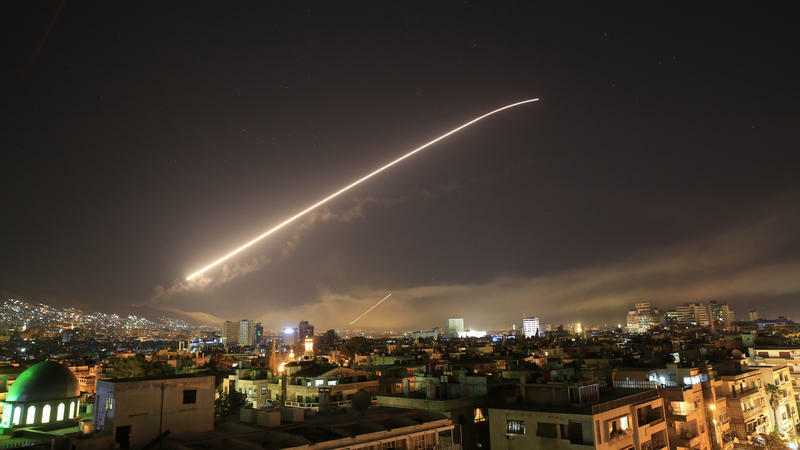 The U.S., Britain and France carried out airstrikes early Saturday against three sites in Syria in response to a suspected chemical weapons attack last week by President Bashar Assad's regime.